The Valley Local: So, whadja get for Christmas? I love hearing the answers to this question, especially from fellow model railroaders. You may have gotten something I've never heard of and it's neat to hear about all the cool stuff (and get ideas for future shopping lists!). Building software: Making mockups this past fall turned me on to a cool process for making buildings quickly, and I'm hoping this software helps in that effort. Resin Casting How-To DVD: I'm hoping that I'll be getting to details soon and populating a layout with hundreds of details (pallets, barrels, etc) can get very expensive if you buy them all commercially. And I'll likely have to scratchbuild the supports for the Rt. 15 bridge over the north end of Wethersfield - and scratchbuilding just one and then casting/copying it will be much better than having to scratchbuild a dozen (and I'm hoping casting them will give me more consistent results). Resin casting starter kit from MicroMark: all the stuff I need to get started. So what cool model railroad stuff did you get? Share in the comments below! An assortment of sanding sticks, and a couple silicone glue brushes - mostly a carpenter's tool, since wood glue (or any pva) comes right off the bristles, but I'll use it on the layout and perhaps on wood models. Also bought myself a few more details, couplers and wheels for my 2015 challenge - to spend nothing on the trains and work solely from my Home Hobby Shop. 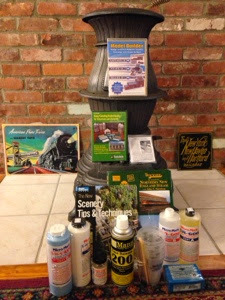 Thanks for sharing your "haul" Galen! And that 2015 Challenge of yours sounds like a really great New Year's Resolution. I suspect a lot of us have "home hobby shops" that continue to grow, while we don't get to build as much. Oh - almost forgot the nicest gift - a set of Wiha screwdrivers, which will replace the ragtag collection of screwdrivers currently in my tool drawer. The set came with a bonus pair of needlenose pliers, but they won't replace anything, just add to what's there. I love my current needlenose pliers too much to set them aside. I have no such love for the odd collection of weak, bent, off-sized screwdrivers I have amassed over the years. Quality tools are always a great investment and those screwdrivers sound great. Wiha brand? I'll google them, but definitely would like to learn more about them. And what kind of needlenose pliers do you use?